Cat Chat With Caren And Cody: Today Is "Meow Like A Pirate Day", Meet "Dread Pirate Kidd" aka Captain Cody! 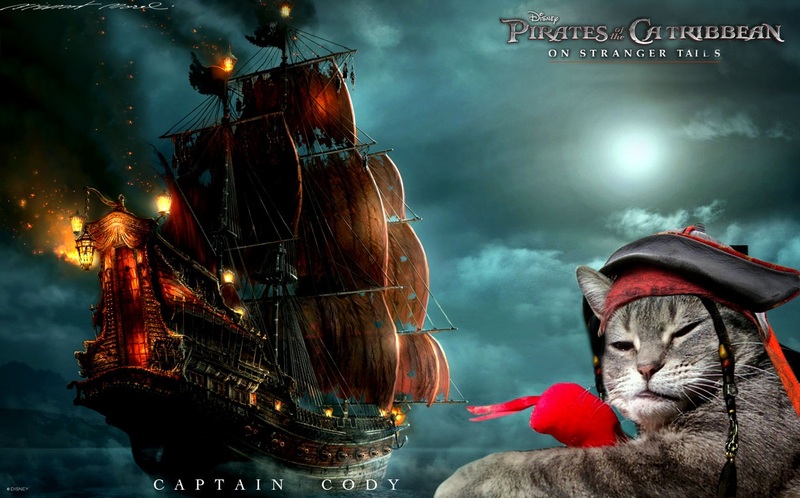 Today Is "Meow Like A Pirate Day", Meet "Dread Pirate Kidd" aka Captain Cody! Fabulous badge compliments of Zoolatry! The pirate speaks,"This made me Ahoy! Er happy because thar be NOTHING I like better than me Mousie!! While we were workin' on this post me Mom and I wondered what me Pirate name should be? We found this cool site that actually made a "Pirate Name" for me Check out me name"
I be one lucky kitty fer sure!!! 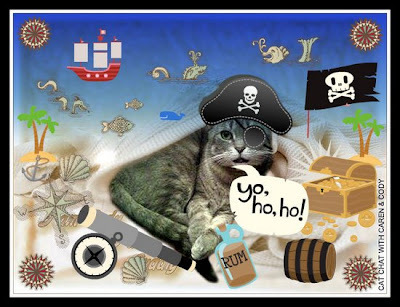 I have a pair incredibly talented photographers who surprised me Mom 'n I wit' purrfect scurvy pirate photos, specially made, just fer ME!! If they hadn't done that me Mom would have had one completely LAME blog message fer this day. Mom 'n I be in AWE (that's AWE, not AYE) 'o their thoughtfulness 'n talent! We be as lucky as a chest 'o scurvy pirate's lovely booty!!!! "Yo, ho, ho me Mateys!!! arrr while I have a swig 'o me spiced rum!! Hop on board th' jolly Ship Cody! The pirate speaks,"Mr Puddy and his Momme really KNOW that I be all about me mousie!" Now what be ye lookin' at!? thar's grub to be made 'n a deck to be swabbed. Hop to it! We don't have all day ye be knowin'! Ahoy there. Cody makes a swashbucklingly handsome pirate, loving the artwork! Happy Meow Like A Pirate Day! Aaah...Cody, instead of the Black Pearl, you have the pink mousie...Avast! purrr...meow! arrrggghhhh Captn! If we swab de deck, can we haf a bottle of rum and chicken??? arrrrggghhhh! I'm impressed for so beautiful artwork!You are an awesome pirate! AAArrr, ye be a most excellent pirate, but methinks yer mousie may have scurvy! I like yer name !!! " Dread Pirate Kidd " That`s so cool ! I must check ou' me name too ! Ahoy Matey! Shiver me timbers, butyou makes a mighty scary pirate. @Kitcaboodle thank you! Same to you!! I just love the photos too and it was so nice of Puddy and Catwisdom 101 to make them for me! @Old Kitty "most pirate-y!" I love it! xoxoxo Tell me matey Charlie ARRRGH! @Mariodacat Ahoy!! Yay! I LIKE being scary!! @CaroScat roflmao is all I can say! @dArtagnan Rumblepurr/Diego Hamlet Moonfur Haaaaaaaaaaa!!! Cause my mousie is RED!!! MOL! Ahoy, Dread Pirate Kidd! It iz I, Captain Roger Bonney uv da good ship Boomer'z Furroshus Revenge! (hehehe) I'z got awl mai scallytailwagz hard at it, swabbin' da decks 'n nappin' (erm, lookin' fur land) in da Crow'z Nest. Care ta come aboard 'n split a bottle o' rummy milk 'n sum nice fresh mousie wif me? We can even haz a bit o' 'nip fur dezzert! Arrrrrrrr!! You are one terrific pirate Captain Cody! Careful on the poop deck! Great name and pics. Ye be in with the best o' them pirates today! Avast matey, our ship sailed late but we're up. So glad you liked our pirate pic of Cody. He make a fine one to sail the seven seas. Great pictures Cody (or should me say Cap'n Kidd) yous looks especailly fierce! Happy Meow Like a Pirates Day, Cody! Go easy on that rum and save some for your Mum! What a dashing pirate you make! Love the graphics! @Cat thank you!! Happy Meow Like A Pirate Day to you too! @ Ann thank you and you too! Nope! Mom said I could drink ALLLLL the rum that I want! She prefers Kahlua! @Cats of Wildcat Woods THANK YOU! I am only among the "best" because of 2 incredible people who made me photos totally by surprise!!! Mom and I love Cat Wisdom 101 and Puddy!! Mr Puddy did an amazing graphic for us too - his mom just emailed us and sent it and we had asked Ann at Zoolotry to do one for us so we were very lucky cos we ended up with two. We love Cap'n Cody's picture with his mousie! Cap'n Cody, we'd be fine n'proud to sail wit' ye! Wonder if there's any scurvy 'dogs' in Meow like a pirate day? @Hannah and Lucy why did I think I saw yours? I might have missed it. I have a bunch of work to do tonight but will definitely go to the linkies in the blogosphere and check it out before the week is done! :) Happy Meow Like A Pirate Day! @MarkD60 I bet there are "scurvy dogs!" @Benny and Lily ohhh I bet you could! @Ginger Jasper I do too! Thank you! @Katnip Lounge, I would LOVE to sail with YOU! If I don't get over there today I will before the week is out! Aye Meowmeowmans I am honored to sail with you as well! Happy Meow Like A Pirate Day! Myyaarr, these be pictures worthy of true pirate cats! 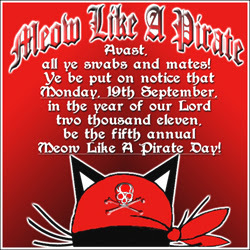 Have yerselves a fantastic Meow Like a Pirate Day! Aye, ye be a fine pirate, Cap'n Cody! Arrrrrr!! Wow those photos are fantastic! Love them!! Happy Meow Like a Pirate Day!! AAAaaaarrrrrrrrrrrrr! We did't nose bout da Piwate Day, ouw secwetawy needs to get hew act togethew! If it weren't for PUDDY! my post today would've probably been about the weather--oh wait! That'll be tomorrow's! Yo ho ho! @Troythulu thank you!! We were sooo lucky, without Puddy and Cat Wisdom 101 we would have had nothing! @Spitty-the-Kitty lmao!!!! I am the same! @Chloe and Cecil thank you!! You can have a Pirate Day any day! @Stacy and Ellie me too! @The Island Cats thank you!